Decked out in a striking blue suit and white shirt, matching his political allegiance, Simon Slama rubs shoulders with fellow candidates ahead of Tunisia's municipal elections. Nothing unusual about that -- except he is the only Jewish candidate, standing for the Islamist Ennahdha party. A public relations stunt for some; a sign of genuine liberalisation for others. But even if Slama fares dismally come the May 6 poll, his candidacy has become a major story in the nation. Slama and his relatives are among the small number of Jews still living in Tunisia. The community in the North African nation has shrunk from several hundred thousand before independence in 1956, to just 1,200 today. 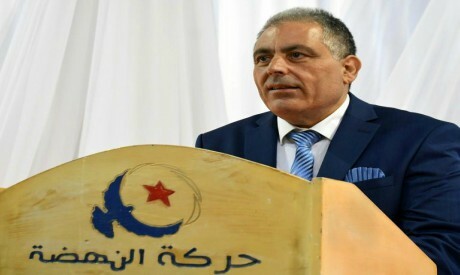 Comrades in the Ennahdha party insist Slama is the right man to stand for office in Monastir -- a symbolic town for Tunisians as it is the birthplace of Habib Bourguiba, the father of the country's independence. "He comes from an ancient family. He has his roots in Monastir... and he knows the town's problems," says Chokri ben Janet, who heads the party's candidate list in the town. Slama says that despite its history as an Islamist party he opted for Ennahdha out of political conviction, describing it as "the most active and the most serious on the political scene". "Ennahdha has changed its strategy -- it is no longer a religious party, it is a civil party," he says. All of these changes -- including Slama's candidacy -- have drawn derision from some political opponents who accuse the group of simple opportunism to bolster its vote. Others say that interest in Slama's candidacy highlights that while Jews can practice their religion freely they remain an anomaly in Tunisia -- and shows the country still has a long way to go on minority rights. The media frenzy is testament to "this obsession we have of judging (people) on the basis of something so personal as their religious conviction," says Yamina Thabet, an official for Tunisia's Association for the Support of Minorities. And as for the candidate himself -- he appears comfortable with his identity and the attention his foray into politics has garnered. If he wins, Slama says, he is ready to take the oath of office on "both the books" -- the Jewish Torah and the Muslim Koran.